Our Glasgow airport Park and Ride packages are great value, easy and very convenient. We have two car parks available; both are close to the airport and provide regular transfers, which are included in the price. Simply park your car, catch the bus to the airport and when you come back from your holiday, your car will be just a short bus ride away. Glasgow airport parking is simple and familiar with a park and ride service. Why is it a good idea to pre-book with HolidayExtras.com®? Quite simply, the sooner you book, the better the price will be. As availability decreases, prices will rise, so book as early as you can to get the best deal. We also offer a Best Price Guarantee so you can purchase any of our Glasgow airport Park and Ride packages with peace of mind that you wont get a better deal elsewhere. Once youve booked, well send you confirmation and directions to take along with you. What are my options for Glasgow airport Park and Ride? Our car parks are fully secured, with 24-hour CCTV, fencing, floodlights, regular patrols and entry and exit barriers. Both hold the ParkMark® award, which ensures high safety and quality standards. 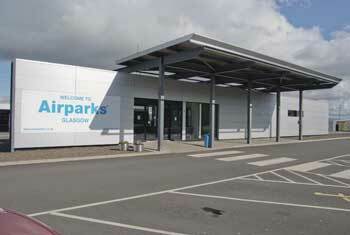 Airparks Glasgow is just ten minutes away from the airport. Transfers are wheelchair accessible, included in the price and run every 20 minutes, 24 hours a day. Its our best-seller thanks to its great price and efficient service. Airparks Glasgow also has a Return Greet service, where your car is brought back to the terminal for you when you get back from your holiday. 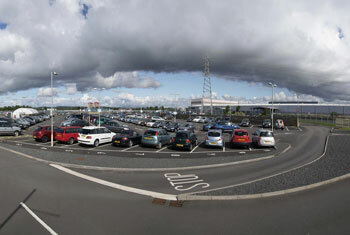 The Long Stay car parkat Glasgow airport is the official BAA on-airport car park. It is just a mile from the terminal and transfers take ten minutes and run every 15 minutes, 24 hours a day. The Long Stay transfer buses are wheelchair accessible and the car park has parking spaces for Blue Badge holders.